Driver in Bay Street crash apparently lost consciousness before the accident, police said. WINSLOW — A man was taken to the hospital after the pickup truck he was driving veered off Bay Street and into a house Friday. The man, Rodney Giroux, 57, of Winslow was unconscious when police arrived, said Winslow Police Lt. Josh Veilleux. The man’s father was in the passenger seat and was uninjured. Giroux was taken to MaineGeneral Medical Center, Thayer campus, before being transferred to Central Maine Medical Center in Lewiston, where a hospital supervisor had no information on his condition Friday night. Giroux apparently lost consciousness of the southbound truck, Veilleux said. 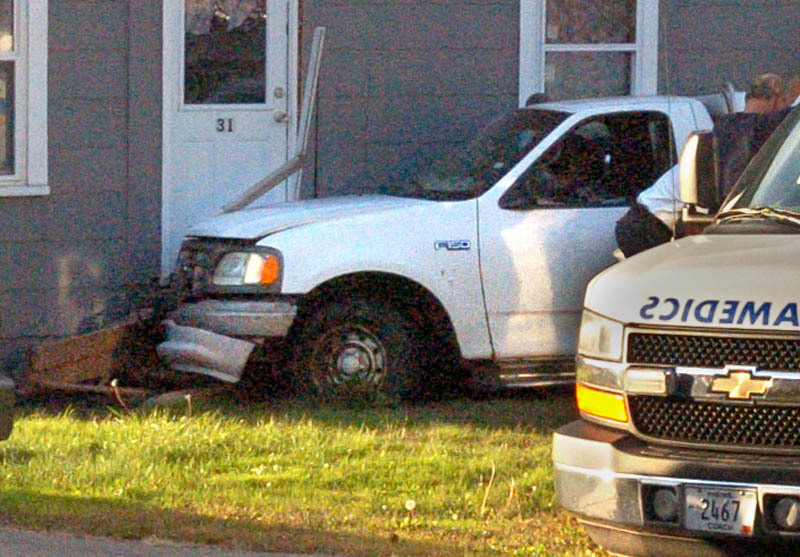 The truck went through the parking lot of Carquest Auto Parts before crashing into the house at 31 Bay St. The people living in the house were outside at a neighbor’s home when the crash happened. Scott LaPierre, who lives next door to the house and was outside when the accident occurred, said the driver appeared disoriented as the truck approached the house slowly before colliding with the stairway to the front door. LaPierre said he went to the truck to see what happened. “I went up and turned the truck off and I could tell he wasn’t conscious,” LaPierre said. LaPierre said that the driver’s father said he had never acted that way before. Neighbors called 911 after the crash.